In order to store onions you’ll need to ‘cure’ them, which simply means drying the outer skins fully. To do this, move your onions under cover. You can dry onions on racks or on layers of newspaper in a greenhouse, hoop house or cold frame. This also works for other alliums such as shallots and garlic. Spread the onions out as much as possible and make sure there is plenty of circulating air to wick away moisture and to prevent mold or rotting. The onions may take a further two weeks to dry out. They are ready to store when the skins are papery, the leaves are completely shriveled up, and the roots are wiry and dry. Onion strings are a very practical and attractive way to store onions. To make one, begin by cutting a length of string to about three to four feet, or a meter. Tie the two ends together to form a loop, then hang the loop from a hook to begin working. Insert the first onion through the center of the loop then bend the stem around the back of the string to return it through the loop. Push the onion right down to the bottom of the loop to anchor it into position. Now begin working in additional onions in exactly the same way – placing the stem through the loop, weaving it around the back of the string and returning it back through the loop and pushing down to sit snugly against the previous onion. Rotate the position of each additional onion so they sit neatly in a spiral. 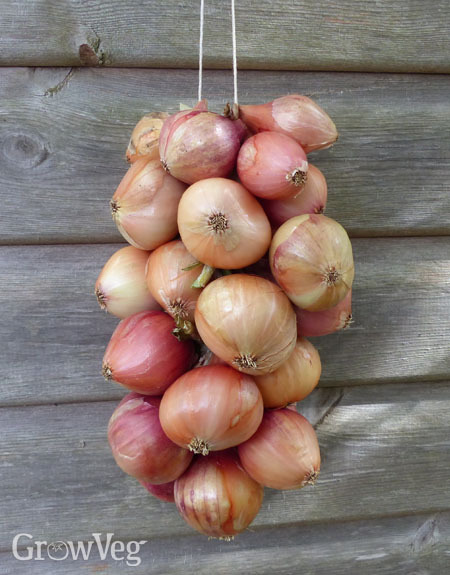 Hang your completed string in a cool, dry place and enjoy the onions as needed, remembering to take onions from the top of the string rather than the bottom.